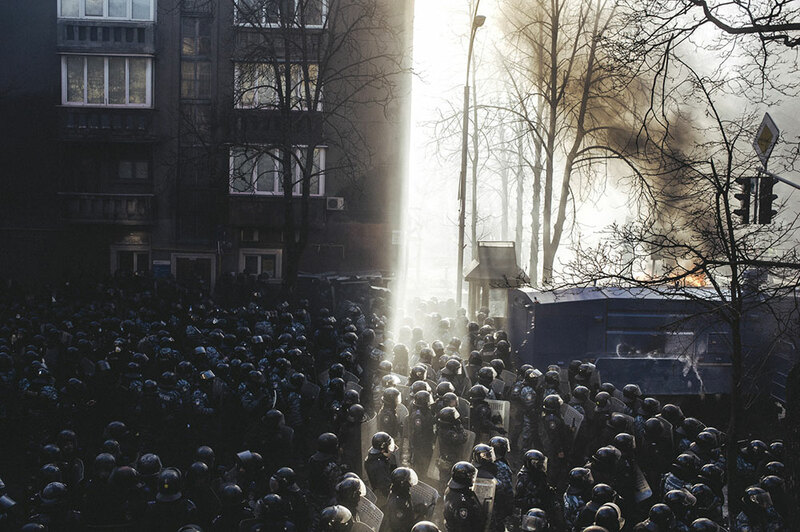 Maxim Dondyuk‘s work with shortlisted for our ‘Street Life’ theme – his powerful image of public unrest in Ukraine capturing beauty in chaos, the art in a political revolution. We now feature the series from which that image was taken; ‘Culture of the Confrontation’. Winter 2014 changed Ukraine. 3 months of bloody clashes, tears, fear, Molotov cocktails, burning car tires and deaths. Ukrainian revolution brought a new spirit and changed people, as they became a single organism fighting with a great passion and intensity for their human rights. 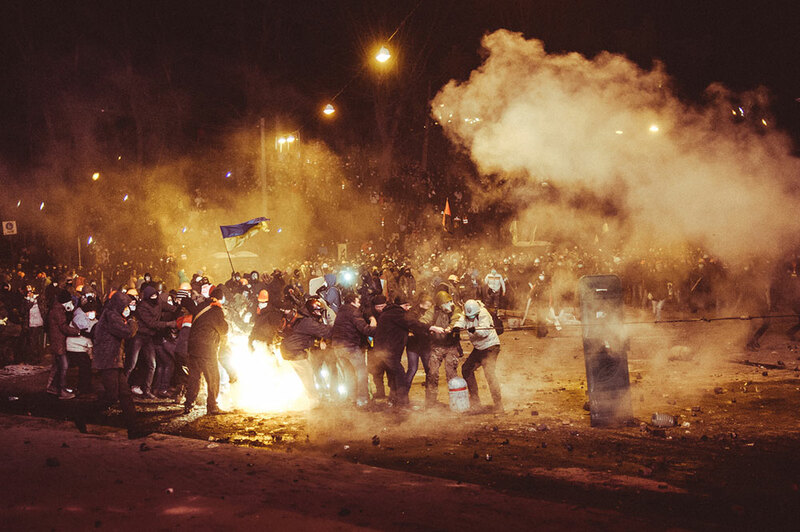 From the very beginning Euromaidan turned into a real performance – a battle of opposites. Good and evil, light and shadow, thick black smoke and the whiteness of the February snow. On the revolutionary canvas, bloody scenes interwove with incredibly beautiful environments. I lost the line between reality and fiction. I forgot the place, time and the cause of what was happening. In one moment the battle scenes reminded me terrible of the previous wars, legends, fairy tails. 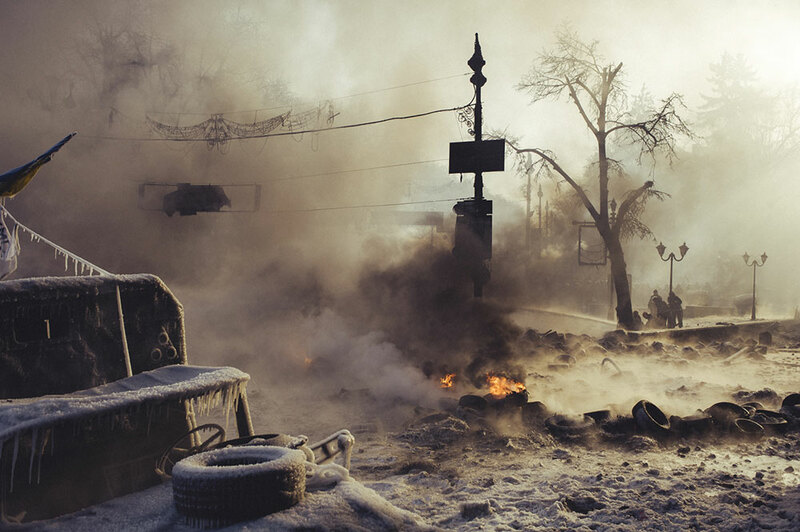 In another the frosty, fiery battle turned Maidan Nezalezhnosty into a phantasmagoric place. The title ‘Culture of the Confrontation’ shouldn’t be taken too literally. 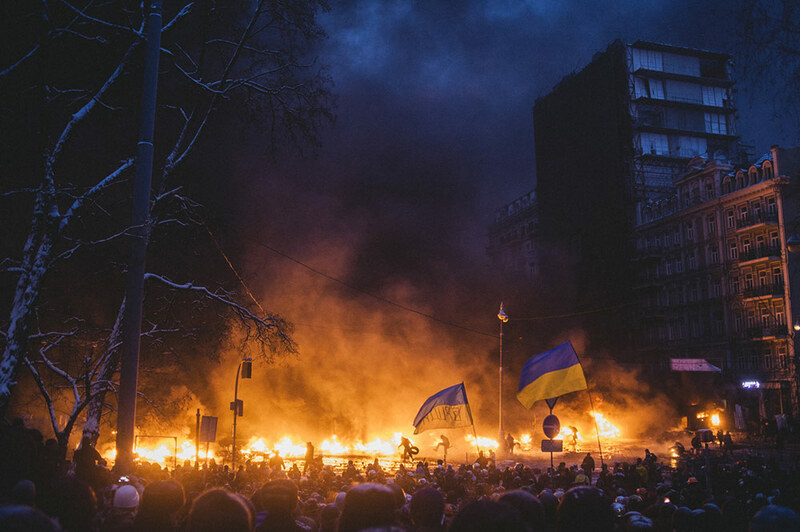 Everything that happened in Ukraine, beginning with Euromaidan, is a confrontation of two different cultures. Those nostalgic about the former Soviet Union, and another that looks only forward and believes in a happy future for the country. By ‘culture’ I mean world view, style of life, people’s thoughts, religion. 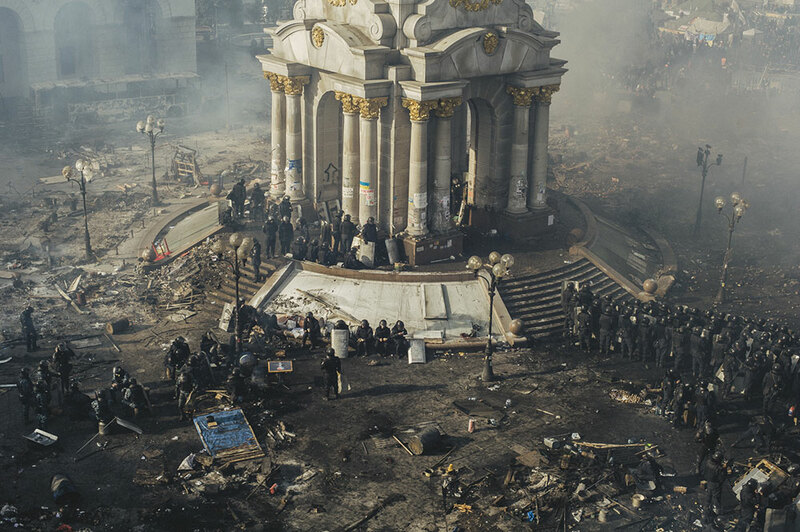 At Maidan it wasn’t two different generations at battle, it was two cultural layers living on one territory. This confrontation is eternal. It started a long time ago and will continue again and again. It doesn’t matter where. 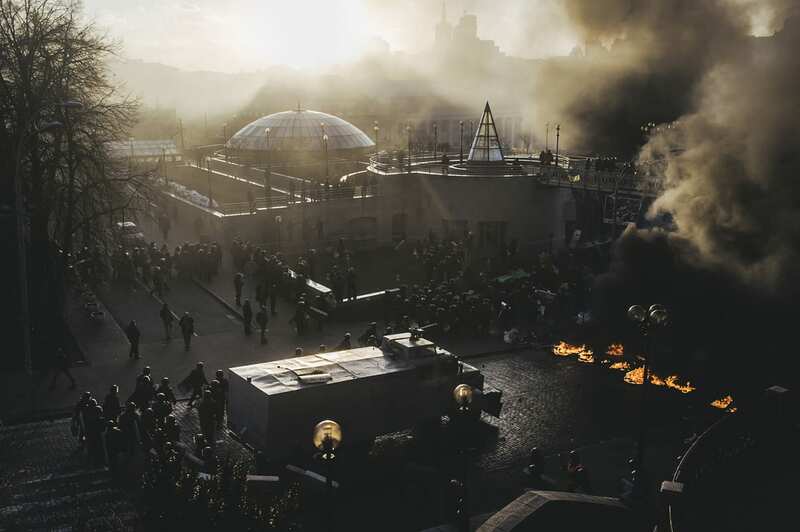 You describe the scenes in your series ‘Culture of the Confrontation’ as “the most beautiful revolution”, and it’s true that the interplay of light, smoke and fire against the architecture of Kiev is spectacular. Was it a conscious decision to capture this beauty, alongside the destruction? I did not have any desire or decision, I just photographed what I saw. My consciousness perceived the events in such a manner. I tried to show the scale of all that was happening, and in the process the line between reality and fiction sometimes became blurred. I would forget the place, time and the cause of what was happening, and felt myself transported to some phantasmagoric place that resembled the awful battles of past wars. 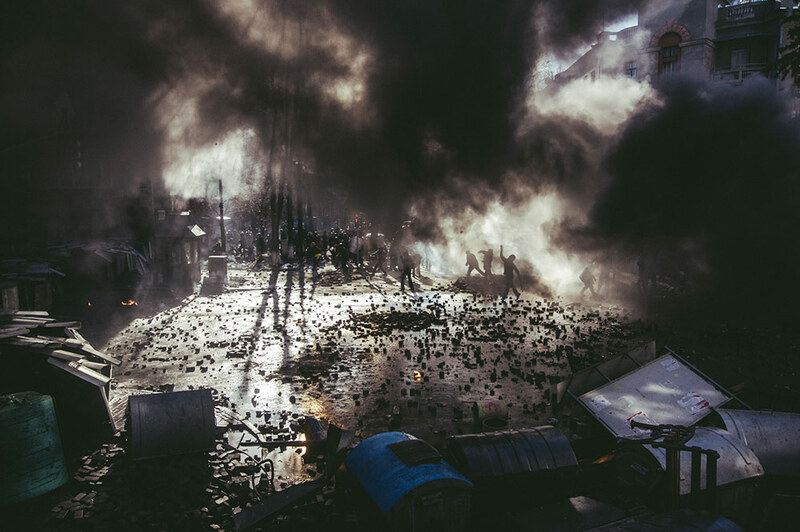 In that sense, what happened on Maidan became a symbol to me of opposites colliding, and in the process, the details of the city I knew so well, of carefree Kyiv, melted away. On your website, you describe your approach to this project – how you aimed to fill your work with second meanings, and aimed to avoid a focus on place, time period and reason. 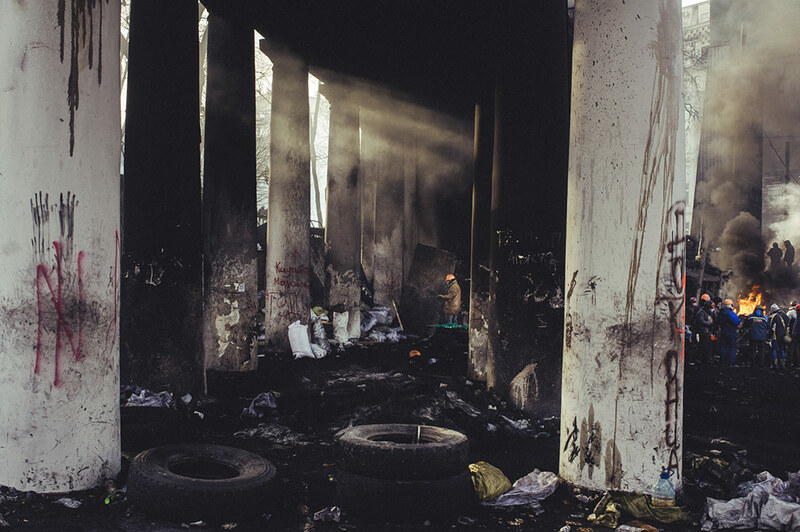 In this sense the project moves slightly away from photojournalism, and towards conceptual photography. What was your reason for that? Was it artistic? Or political? In mid 2013, for a number of reasons, I seriously thought about documentary films. It seemed to me that they tell socially relevant stories much better than photography. I decided to make a documentary film about one of my projects about the Crimea Sich. In summer 2013 my brother and I went to the Crimea Mountains. It was an attempt to find answers to the questions that gripped my mind. The Maidan started when I was editing my film, on which I am still working. 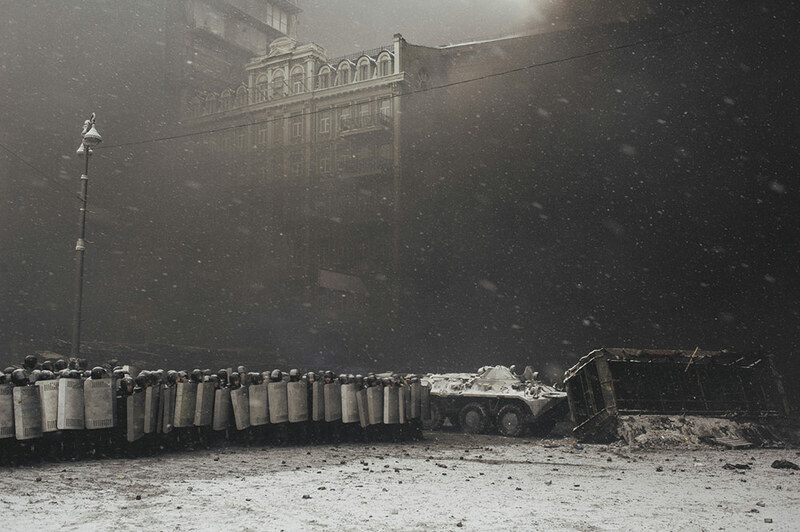 Prior to December 1, 2013 I couldn’t understand whether I needed to continue working on my film, or to go to the Maidan with a camera. 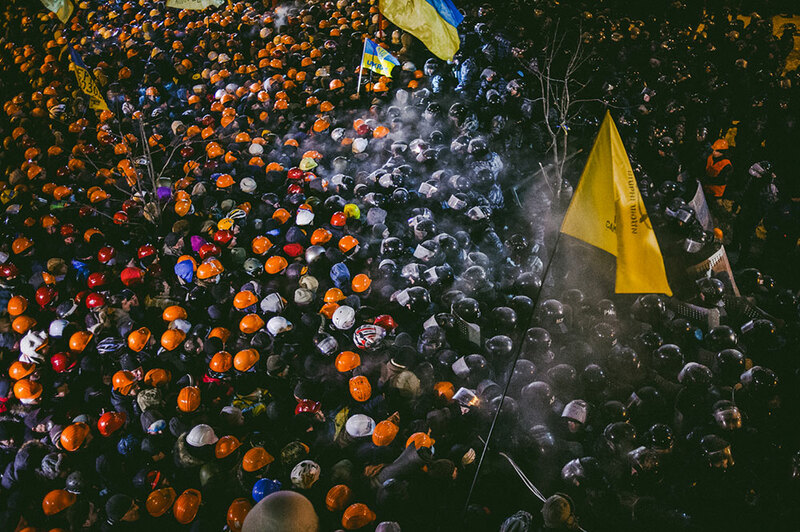 I also didn’t know what I want to do at the Maidan, to shoot video or photo. So at the beginning I just watched, analyzed, tried to find the answers took videos and photos. But, at some moment I was given the second photographic breath and understood that photography for me is an art. I refused to tell stories and thought only about visual language, about visual images, associations, parallels. I started to feel myself as a visual artist, working with documentary, but no longer feeling like a journalist. On the Independence Square (the Maidan) I was completely immersed in a subjective perception of reality. I showed the reality that distorts passing through my mind. But my work is still ‘documentary’ and my photos show nothing other than what I was seeing. Like paintings of realist artists that we can see in the museums. A project like this has an element of danger to it, and also presents a logistical challenge – moving around in the chaos to capture so many scenes, and find the right vantage points. How do you go about this? Does it take a lot of planning and preparation? Or are decisions made in the moment? In this case, you couldn’t plan anything, since everything happened spontaneously. Everything I managed to shoot, happened due to my irrational thinking and intuition. Sometimes you need to switch off your brain, logical reasoning, and listen to the inner voice, which doesn’t have stereotypes and prejudices. I just was on the Maidan, was immersed in this atmosphere, was part of the organism, and the camera was my notebook where I ‘wrote’ down my emotions. “I was immersed in this atmosphere, was part of the organism, and the camera was my notebook where I ‘wrote’ down my emotions”.